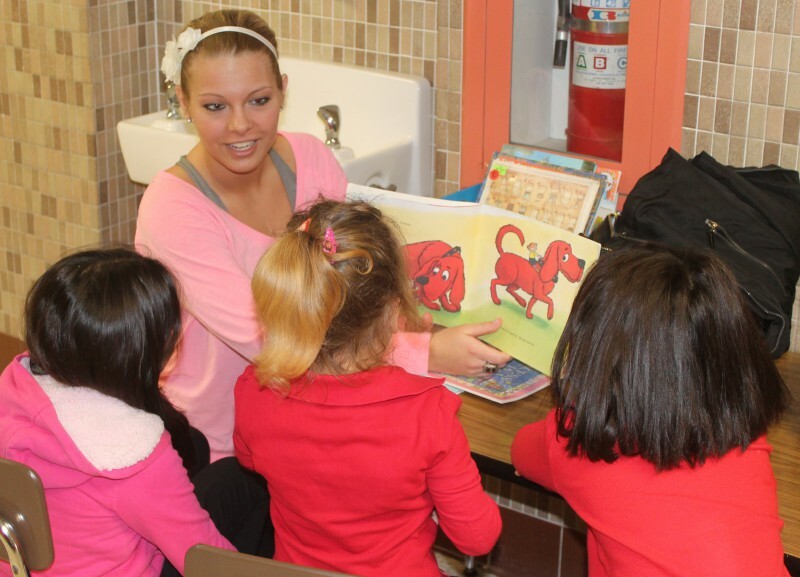 College student and athlete volunteers shine at local elementary schools. Liz Aschwege has a passion for sharing her love of reading. Her program, Reading with the Stars, is a partnership between local college students and athletes and area elementary schools. Teams from Aquinas College, Grand Valley State University, and Grand Rapids Community College have all been involved. 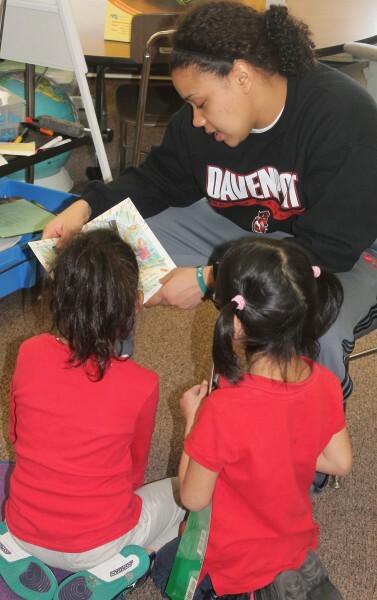 Most recently, players from the Davenport Women’s Basketball Team and some of Aschwege’s Davenport University students received a warm welcome from Principal Evelyn Ortiz before reading to kindergarteners at Buchanan Elementary. 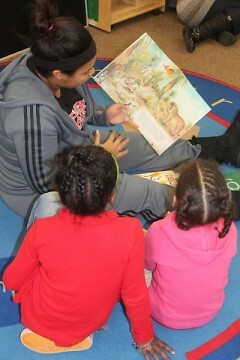 Reading with the Stars is modeled after Schools of Hope, in which community volunteers read with elementary students on a weekly basis. Aschwege, who volunteered at her kids’ school for years, wanted to extend her impact into the community. At Buchanan, each college student hunkered down on the floor in classrooms and hallways with two or three students and read with them. Kids’ faces lit up as they pointed to the illustrations and asked questions. When older students read with elementary school children, they foster a love of reading and help children improve their literacy skills. For some young children, their interaction through Reading with the Stars provides the first spark in their minds about college. College students who may not view themselves as teachers of literacy are empowered by the realization that they have all the skills they need. Looking to the future, Aschwege plans to grow the program with schools and colleges that are interested in participating. She sees it as an honor to go into the schools and to work with college students who want to give back to the community.